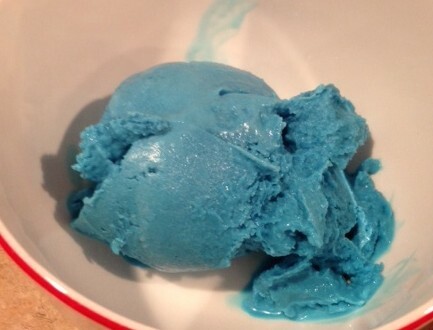 I grew up watching the smurfs, so when we stumbled upon Blue Smurf ice cream in our local gelato spot, I was a bit grossed out. My kids however, were in love with it. It tastes a bit like Cotton Candy and Raspberry, and the color is definitely attractive to a pile of kids who think dying their tongues different colors is a fun thing to do. After spending $15 on a small bucket of the stuff, I decided there must be a less expensive way for the kids to get their smurf fix. Digging out my trusty ice cream maker from the depths of my crawl space, I hit the web for a recipe that would work. 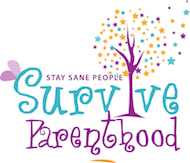 I found this one below on seriouseats.com. Cooking up the blue smurfs, just like Gargamel! In a medium bowl lightly beat egg yolks with a 1/4 cup of sugar and set aside. In a medium saucepan add cream, milk, and remaining sugar. Whisking occasionally, heat mixture over medium low heat until bubbles begin to form along the edges of the pan. Remove from heat and add heated cream mixture to the eggs one tablespoon at a time while whisking constantly to temper the eggs. Spinning the broken ice cream maker with his finger! 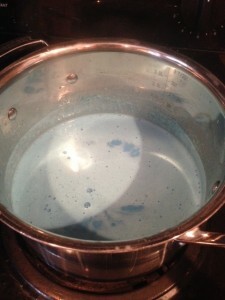 Once the cream mixture and eggs have been combined return to the saucepan and heat on medium low until mixture coats back of a spoon or spatula and line drawn with a finger leaves a distinct trail. Mixture should register 170° to 175° F, do not allow mixture to overheat. Pour custard into a medium bowl and whisk in vanilla pudding mix until thoroughly incorporated. Whisk in raspberry flavoring, lemon oil and vanilla extract until thoroughly incorporated. Set bowl over an ice bath. Let cool at room temperature for 1 hour, stirring occasionally, then cover and refrigerate for 2 more hours or up to overnight until completely chilled. Churn chilled custard according to your ice cream maker’s instructions. If your ancient ice cream maker gives out right when you’ve plugged it in for the first time in 6 years, make sure you have a child handy. 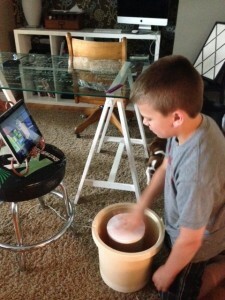 Rather than let the mixture go to waste, he sat spinning it with his finger for 1/2 hour. It still turned out great! Transfer ice cream into a bowl or container that will hold 1 quart. Cover and freeze for at least 3 hours to fully set. Serve.